At one of North America’s largest pop culture conventions featuring celebrities, cosplay, comics, movies, anime, manga, collectibles and more, I was a guest on Wattpad’s panel with other writers discussing digital storytelling and online literature community, publishing trends and career, writing processes and philosophies, multimedia and social media culture in a new era. Wattpad is an award-winning Toronto-based startup and the largest global online writing and reading community and platform with over 65 million users, mobile and desktop technology, and publishers, editors, agents, aspiring writers and established authors such as Margaret Atwood, Dan Brown, and Paulo Coehlo. The full panel is available on youtube for a glimpse into the new era of online serialized literature and youth culture. It was an amazing experience to be able to share my thoughts in front of a large crowd in a press conference style hall. The guest pass also enabled VIP access to the whole event so that’s a first for me. Check out the full panel on youtube above. Takatsu, known as a passionate trailblazer of online literature and transmedia storytelling, is an award-winning writer of contemporary literary fiction, featured Wattpad author of over 14,000 followers, kickstarter of the Literary Fiction Network, pioneer of the English language cell phone novel, poet, philosopher, musician and Literature student based in Toronto. 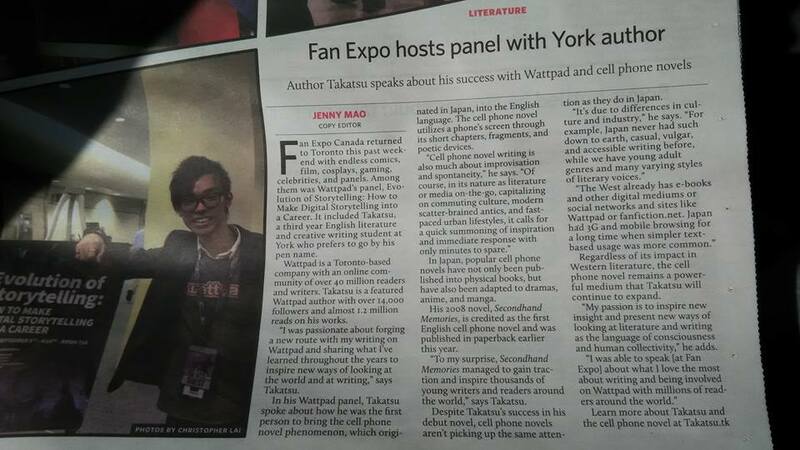 This is certainly one of the perks of living in a big country with a bunch of literary events taking place, plus having a company such as Wattpad.